Girlia's Cards: Happy Blogaversary and New Year! Happy New Year Everyone! Thanks for stopping by to join in on the fun and celebration of this hop. Diana of DL.Art is celebrating one full year of blogging! That is exciting. I am just so fortunate and honored to be asked to participate with a talented group of ladies. Congratulations Diana---Onward to the hop! There are 13 stops, four people (blogs) will have word/clues or ingredients you will need to complete your project. Link your project up and you will have a chance to win the Sweet Tooth Box Cartridge. No back linking. Diana is the hostess of this hop. She will begin and you will end with her. She is definitely the one you want to visit to share your good wishes. Plus she will have great blog candy. would like to start from the beginning just click on Diana's name. Comments are welcome. Enjoy and GOD Bless! Blog Candy. Yes I will also have blog candy. I am not sure if it will a cartridge or gift card to Joann's Hobby Lobby, or Micheals--Oh wait how about I let you decide. I will chose a winner January 7th 2012. Brenda Congratulations. Send me your info. I have contacted you 2x. Please respond with the next couple of days, Jan. 6th 2011. Gloria your projects are beautiful. Your cake is to die for and your tag/card is fabulous. Great job. Amazing pieces. Love the colors. What a beautiful set you have created for this special hop. Love the pink and green flowers. They really "pop" on the swirls. Oh wow...your card and cake are outstanding! You really put a lot of time into these. TFS. Simply amazing creativity! Always such a delight to stop by your blog to see what you are creating. Thanks for sharing your talents with us and HAPPY NEW YEAR!! This is so cute. I love that border punch and all the bling. Fabulous! Just love things like this and what a pretty keepsake this will be. This is stunning Girlia, you have out done yourself!!! YOU ROCKED THIS! Wow! So much detail. You did a fabulous job on this. Thanks for the fantastic hop! I love the bright colors you used. The cake is amazing! Wow! You did an amazing job on this. Love the card and the cake! Fantastic job on your card and cake. The colors are great and your projects so detailed. I just grabbed your button and became a follower. I'll be back and see more of your creations. Your card and cake/gift box set is so cute and I love the color combination that Diana chose for the hop. It fit your creations perfectly! Beautiful project!!!! Fun being in the hop with you! Absolutely beautiful!!!! I love the look of the cake and the tag card is adorable!!! Happy New Year!!!! Like the cake creations. Especially like the 3D cake. Thanks for giveaway chance. OMG what a beautiful card and project! I love all the flowers and love the colors all together!! WOW! This is an Amazing craft. I love the colors and everything you did such a great job. I am now a new follower! Thanks for sharing this Adorable project! Wow, Gloria. Your card and especially the cake are absolutely gorgeous! The train of flowers you have going down the cake look beautiful and so real. What a wonderful project you made. You've really outdone yourself!--Pat N.
WOw, this is GORGEOUS! 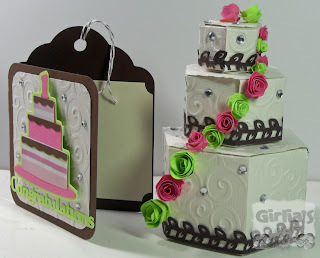 I love the cake and the beautiful flowers along with the cute tag card. Love the colors-fantastic project!!! Wow! That cake box is awesome and the embossing looks great! Happy New Year! Wow look at that cake. Its beautiful and your card is a great additon to the cake. That is a beautiful set! To have both of them coordinated like that makes it very special. Great job! Happy New Year. Wow, this is AMAZING! I am already your follower and this is WHY! Thanks for being a part of Diana's Blogaversary and for the chance at a GREAT goodie! Such an amazing project. I love the detail of all the roses and beads. Great job! Such a beautiful project! The cake is fabulous! WOW I absolutely love your project. Gorgeous is the word. JUST BEAUTIFUL...AMAZING PROJECT...YOU OUTDID YOURSELF ON THIS ONE!! WOW< OMG!!!! Such an awesome job! wOw! These are fantastic! Happy New Year! It's been fun hopping with you! Beautiful prpojects. I love the colors you used. The details are fantastic! Elegant projects. Love the card and the cake. Gloria, WOW!!! What a fantastic card and cake you have made. I love the embossing and the wonderful colors. Oh, this is just adorable1 I love the card, and the cake--the flowers, the bling---so cute!!! OMG...everything is just BEAUTIFUL! I love that cake...WOW! Wow - Love your tag and cake. Super cute! Oh my goodness!!!! Absolutely stunning!!!! 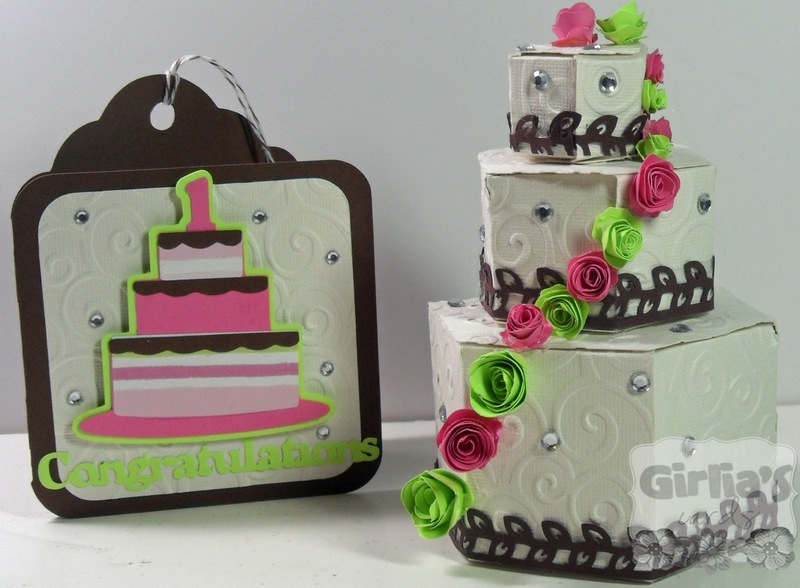 OMGosh, your card and cake is stunning and simple gorgeous!!! You have done a wonderful job on it!!! I saw that I won the Christmas Blog hop with Mary! OMGosh, I can't believe it!! lol I couldn't seem to get your email in the "contact me" so I will give you my email. Thanks ever so much! Absolutely stunning!! I really love how gorgeous the flowers turned out and the colors are fantastic!! Just BEAUTIFUL!! Happy New Year!! Wow Gloria both of your projects are amazing!! Gloria, what a beautiful ensemble. I am definitely seeing a bit of a trend with the projects in the hop *wink*! Fun gift idea! WOW! Such a great project. Love the cake and all of the roses on the cake. Great project. I love the flowers on the card. I'm a new follower. Thanks for the chance at such great blog candy. Superb job Gloria. I truly love the cake. Wow! I wish I knew how to make something like this. Glad to be on the hop with you. Very gorgeous projects! love them both especially the cake. Your projects are beautiful! Thanks for the chance to win. oh gloria, how awesome that cake is. love the trail of flowers. this is awesome! great project for the annivesary! so happy i had time to stop over and start the new year in the same hop as you. Love the cake! And I appreciate you using your creative gifts - God does too! Thanks for participating in the blog hop....what fun!! Don't enter me in the blog candy giveaway, just wanted to stop on by to say how stunning this project looks! Awesome job! Beautiful cake and card! Love the colors, flowers, and embossing! So many gorgeous details! Fantastic work on the cake! Love it! Wow, wow, and wow again!!! Love this cake box and card project!!! WOW!!!! This is such a pretty set and that cake is AMAZING!!! Wow, you've outdone yourself! Simply amazing!!! The cake is gorgeous!!!! WOW, THAT CAKE IS FANTASTIC. LOOOVVVEEE IT!!!! I NEED TO TRY THAT. Stunning!love the colors and the cake looks yummmy. The card is very good and the design of this card is awesome. Wow!! You did an amazing JOB!! I love the cake and the colors are beautiful!!! This is so prett!!! I love it! Amazing! !